The Royal Observatory Greenwich, in conjunction with BBC Sky at Night Magazine, has announced its shortlist for the Insight Astronomy Photographer of the Year competition. You can check them out right here in all their cosmic glory. All images and captions: Royal Museums Greenwich. They are republished here with permission. Photographer credits are included with each image. The cream of this year’s crop was selected from over 2,700 submissions from over 60 countries. Winners will be announced on 17 September 2015. An enthralled stargazer is immersed in the stars as the luminous purple sky is mirrored in the thin sheet of water across the world’s largest salt flat, Salar de Uyuni, in Bolivia. The distinctive shape of the nebula NGC 2359 has led to it also being known as Thor’s Helmet, resembling the headgear of the Norse God (and Marvel superhero). 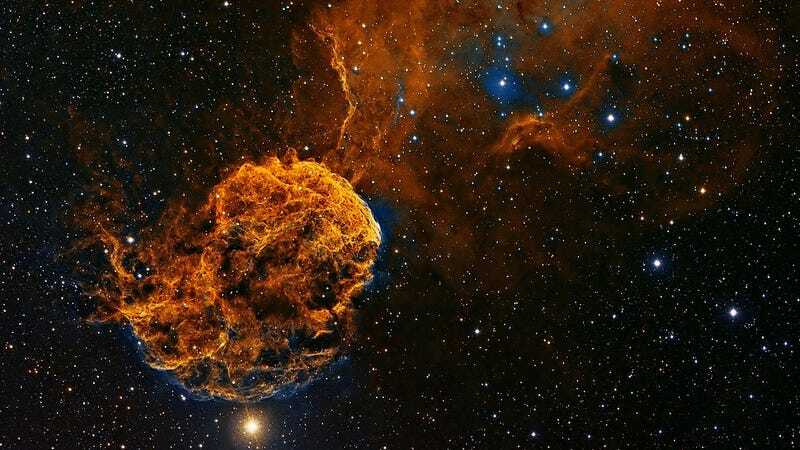 Around 11,000 light years away, the overall bubble shape is mainly due to interstellar material swept up by the winds of the nebula’s central star Wolf-Rayet, an extremely hot giant thought to be in a pre-supernova stage. Late afternoon at San Vito di Cadore, Italy the moon shines over Monte Antelao. The snow-covered dolomite ridge of the mountain and the Earth’s only natural satellite bear a striking resemblance to one another, contrasting against the bright blue of the afternoon sky. The photographer noted the likeness of the image to a snowball bouncing down an inclined plane. One of the most well-known astronomical objects in our universe is the Orion Nebula and this image depicts the wider region of the Orion Molecular Cloud Complex that is home to it. This complex is also home to another popular target for astrophotographers, the Horsehead Nebula, as well as Barnard’s Loop and the Running Man Nebula that can be seen to the left of this photograph. The pinks and oranges that can be seen in the whorls of the nebulae are caused by the extremely hot hydrogen gas present in the structures. The vivid green Northern Lights dance above Lyngenfjord, the longest fjord in Troms county Norway, tracing out the shape of the Earth’s magnetic field above the waters. The most common colour associated with aurorae, the green is produced by oxygen atoms and molecules energized by the impact of solar particles that have escaped the Sun’s atmosphere, causing them to glow brightly.